UPDATE 08/07/2016: Robert has moved on. For bookings go to Blakeney Cottage Company. Robert Greenfield personally marked the millennium when he decided to move from London to live in rural North Norfolk, thereby abandoning his somewhat bohemian lifestyle as an internationally known designer of men’s fashion. This met with the approval of his partner Michael (a top London hairdresser) and their stunning house at Muswell Hill was placed on the market. The search then began for a suitable property that could be converted into a very stylish boutique bed and breakfast establishment. In addition to his success in the world of fashion Robert had also worked as an interior designer with some of his makeovers being featured in magazines and the press. These skills were brought into play as soon as the delightful Holly Lodge at Thursford was purchased. A great deal of hard work was eventually completed and with its stylish interiors filled with artworks, antique furniture, and interesting items that had been collected from many parts of the world, Holly Lodge was open for business. The enterprise was a great success and awards for excellence were soon collected. With success came much hard work and running Holly Lodge left little time for anything else. The decision was made to sell the business and a property requiring renovation was purchased at Stiffkey. Robert once again worked his interior design magic and created a stunning home. Next to the new home is Riverside Cottage, which was converted into a high-quality Norfolk holiday cottage for guests to enjoy. Located in the picturesque North Norfolk village of Stiffkey, this building was originally a stable constructed in the eighteenth century. It is in an idyllic setting and Robert’s interior design work has created a romantic riverside cottage with all the modern features that guests now expect. 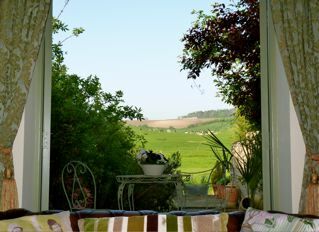 If you are looking for a holiday retreat in a peaceful and beautiful location this Norfolk holiday cottage is ideal. Stiffkey is on the main A149 coast road, which makes access to the nearby small harbour towns of Wells and Blakeney and the coastal villages, very convenient. Further afield is the larger resort town of Sheringham, and Cromer with its famous pier. Walking a short distance from the cottage will take you to the Norfolk coastal path where there are some excellent picnic spots and birdwatching opportunities. Throughout the summer months ferry trips are available from Morston to see the seals at Blakeney Point. The beaches in this area of Norfolk are exceptionally beautiful – Holkham being particularly special. The village pub, the Red Lion, serves good food and the menu changes regularly according to season and the availability of locally sourced produce. There is also a well-stocked post office/shop nearby for supplies. There are some excellent dining opportunities within easy travelling distance. Morston Hall has a Michelin Star award and is listed at 50 in the Sunday Times list of top 100 restaurants. There are also gastro-pubs at Wells, Letheringsett and Holkham. Finding good food in this area is not at all difficult. One-bedroom brick and flint cottage with antique furniture and high-quality fittings. Private south facing sundeck overlooking the River Stiffkey. 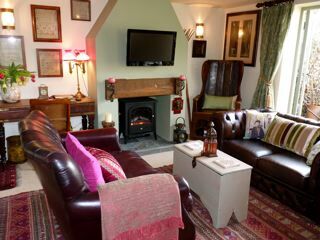 Cosy sitting room finished in heritage colours furnished with some antique treasures. Comfy leather sofas with some great cushions. For winter warmth there is a Bressemer beam inglenook fireplace with a log burner. Large wall-mounted TV with Freeview and a DVD player. There is an impressive Gothic style cupboard filled with books, CDs, and a library of DVDs for entertainment when the weather is not so kind. French doors onto a south facing cottage garden with a gravel path leading to the sundeck. Modern fully-equipped kitchen with double electric ovens and fridge, freezer, etc. Spectacular views towards the hills across the valley bottom. I think Robert has moved on. I don’t know what the current position is with the cottage. An internet search might be worth trying. Is the cottage available anytime between 20th – 26th August for either any 3 nights or all and what are the terms? I have forwarded your message to Robert.